Thanks to its superior quality, Colorbond Roofing, is the obvious choice for many award winning projects for the Brisbane 2018 Commonwealth Games, and is the first choice of Strong Life as well. It is with great pleasure we announce Strong Life’s roofing supplier, Colorbond Roofing, has been used to build one of the nominated entries in the WAN (World architecture News) Awards. The WAN Awards are one of the largest Global awards for architectural achievements. They are designed to recognise new and innovative uses of architectural style. The Gold Coast Aquatic Centre refurbishment using Colorbond Roofing, has earned its place in the ‘Sport In Architecture 2017’ category. Being constructed for the 2018 Commonwealth Games, the Aquatic Centre is specially designed to increase the centre’s sustainability as well as providing a world class swimming venue. With this in mind, the designers, COX – Architecture, chose Colorbond Roofing for the outer and lower layers of the Aquatic Centre’s roofing system. Colorbond Roofing is renowned for both its durability and eco-friendly properties. Likewise, the expansive roofing of the Coomera Multisports Centre has also won an award for its innovative architecture, the 2017 Gold Coast / Northern Rivers Regional AIA Award for building of the year. 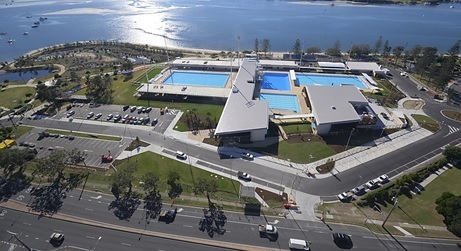 BDA Architecture with Peddle Thorp Architects collected the Coomera Multisports Centre’s award for creating a centre that is ‘both elegant and robust’. These are just a few of the many, many awards won during 2016, by architecturally designed buildings which used Colorbond Roofing. Although, your building probably isn’t considered architecturally ‘significant’, Colorbond Roofing brings a new, clean look everywhere its used. Colorbond Roofing – Strong Life’s preferred metal roof replacement material. Strong Life is a professional company that has been in the roofing and guttering business for over 25 years. All Strong Life Roofing and Guttering jobs carry our 25 Year Manufacturer’s Warranty on Materials, 6 Year Strong Life Warranty on Workmanship and 100% Satisfaction Guarantee*. We are proud to use only Colorbond Roofing Melbourne and Bluescope Steel roofing and guttering materials. And there’s a seniors discount – just to lighten the load on the mature agers.